Quite possibly, our worst restaurant experience in a LONG time. If you’ve been reading this food blog, you’ve probably noticed that the overall ratings tend to be pretty “above average”. Is it because I’m nice… eh maybe. Is it because I try to find the positive in each dining experience…perhaps. Is it because I don’t want to ruin a restaurants’ reputation based on my one experience…probably. For instance, what if I went on bad night, ordered the wrong thing, or just happened to get the only cranky waitress? No need to have a foul review living on the internet for all eternity, right? Yes, in most cases…but my friends, this is NOT one of them! Our pal Irmaliz was celebrating her birthday and her handsome boyfriend, Ignacio, planned a small gathering at a local restaurant on the water, for his beloved. Very thoughtful and well orchestrated by Iggy. He even negotiated a group discount and bringing in some of her favorite wine. Irmz was surrounded by close pals and a promising menu of delightful food. Unfortunately, the menu did not stand up to the good company. ALLLLL ABOARD! There is a trainwreck-a coming! 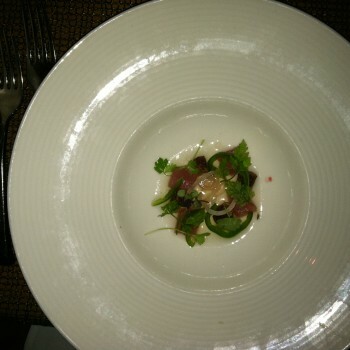 FOOD: Tasting Menu specifically – probably the tiniest portions ever. It was almost comical. After 5 courses, we left hungry. Needed a double-cheese burger from Mickey-D’s. “A for effort” in terms of creativity, but c’mon… yes, we know what a “tasting menu” is, but it was taken waaay too literally here. We came to eat. Sorry chef – food was good, but increase the portions, please! SERVICE: started off bad and got progressively worse. Remember that “group discount” Iggy organized? Yea, well that took 45 minutes to figure out. 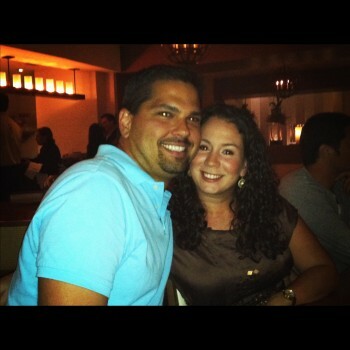 AMBIANCE: standard attempt at a luxury Miami restaurant. Probably would have had a different feel if the experience wasn’t so bad. 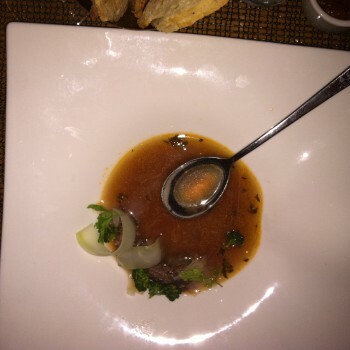 Duck Confit Soup – full flavored broth, and shredded duck was a nice addition. 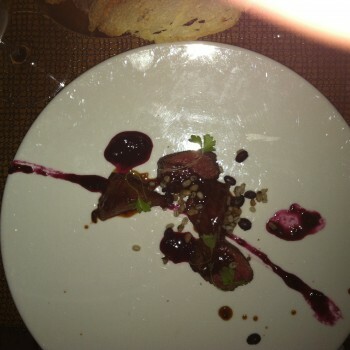 Unfortunately, portion left you wanting more….way more. Cobia “Rueben”: basically a creative “take” on a deconstructed Rueben sandwich. Fun idea, good flavors, but the sushi grade fish with the Rueben flavor kinda wigged me out a little. It was good, but was the one portion I could have done less with. Steak & Veal Cheeks: Really delicious, perfectly cooked meats. They should have left the steak knife in the kitchen because there wasn’t enough meat to even cut. 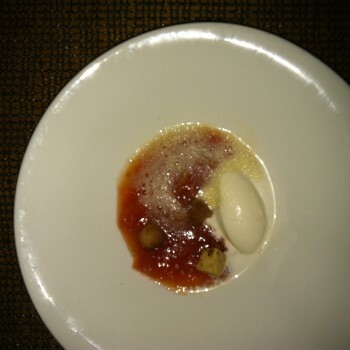 Tomato Foam Ice Cream: nice try on creativity and don’t remember all the ingredients, but nobody finished it.